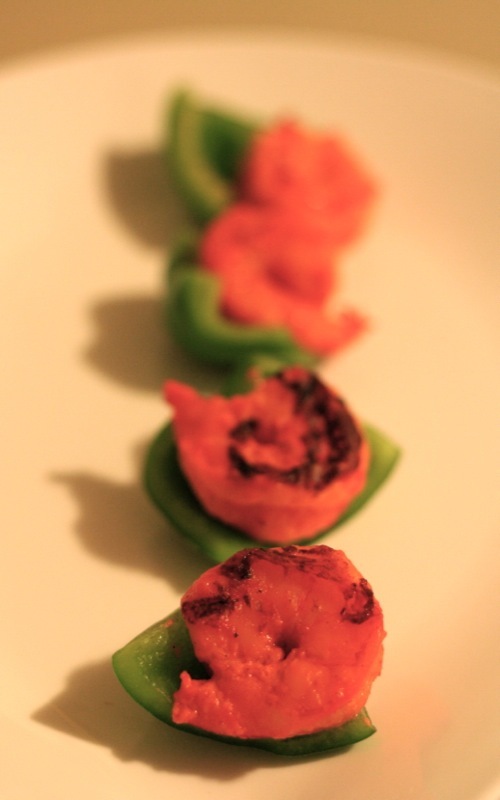 These little shrimp make a perfect appetizer (like these, except a different kind of Asian). I marinated them for a few hours and then grilled them – and yes, they really are that red! 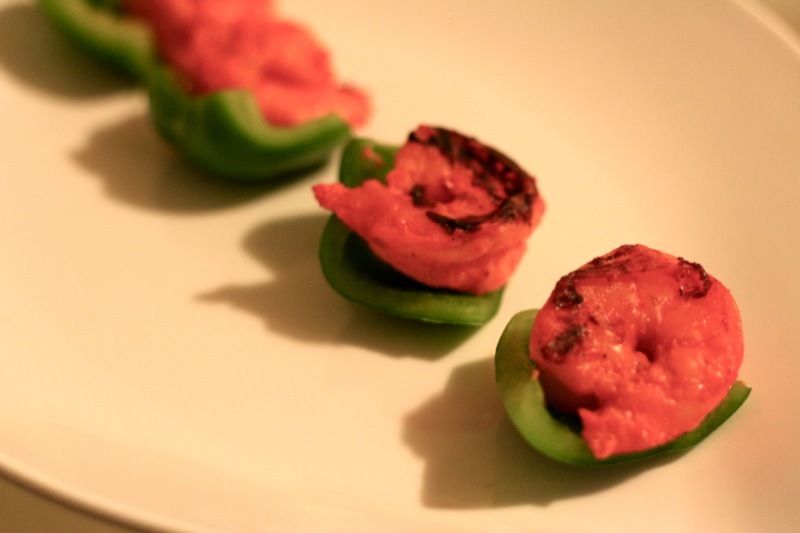 I served them on top of bellpepper slices because usually tandoori meats are served with grilled bellpepper and onion. To marinate: Marinate peeled, deveined shrimp in a mixture of yogurt and a few teaspoons (or more, to taste) of a tandoori or tikka masala spice mix. (I have to say that, as much as I try to be original, I am completely unembarrassed by using a tandoori spice mix. I use the mix by Shan Masala.) Put it in the fridge for a few hours if you’re marinating ahead of time and take them out about 30 min before ready to serve, to let them come to room temperature before being cooked. To cook: Grill or saute the shrimp a couple of minutes per side. Squirt with lemon juice. 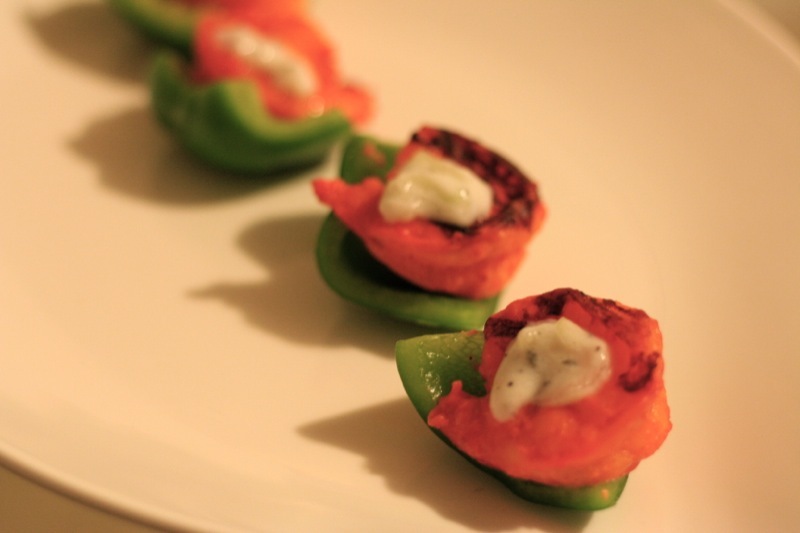 Serve atop slices of green bell pepper with a dollop of cucumber-mint yogurt. Did you use the powder tikka masala or the actual cooked tikka gravy that is available in bottles? CP, I used the powder masala. If you use the gravy, don’t mix it with yogurt, just use it straight!